Bead Necklace and Chain Lengths with Diagram and description of the various Industry Standard Necklace Lengths. 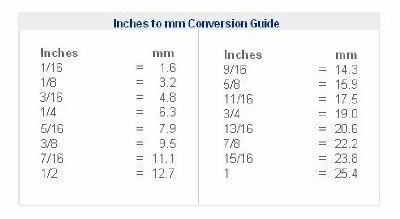 Please use this as a Guideline along with past experience to determine the correct length for your preference and stature. 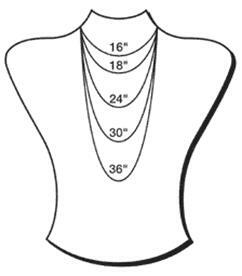 13" to 16" Collar & Choker lengths should be comfortably close fitting, lying above the collar bone, or up on the neck. 17" to 19" The Princess length is probably the most common necklace seen in the graduated strand, although any style necklace can be made in this standard length, which rests beautifully just over the collar bone. 28" to 32" Opera length strand, which may drape extravagantly to one's mid-section or more a necklace that adds opulence to one's most festive attire. Over 45" The Lariat or Rope is a long string of beads, which can be looped, wrapped or draped, as one is inspired. What is the difference? A Rope may or may not have a clasp; a Lariat is an extraordinary length without a clasp. Typically chains are thin and can be measured lying straight down, but if the Chain is thick it should be measured like Gemstone Bead Jewelry which would be a neck form. Just as you would take inside circumference measurements for Cuff, Link and Bead Bracelets, the same concept applies to Bead Necklaces. Compensation in necklace length must be made for the chunky beads. We take our measurement for necklaces using a form rather than taking the length inline.